Maui-based Lyri-Cool Productions introduces five new vocalists with this compilation. As such projects go, this is a better than average showcase. Not only are the young women pictured on the cover, but background information on them is included here as well -- which is more than some other local labels have provided on similar projects. There are no lame remakes here either, although without composers' credits, there's no telling whether these pop and Jawaiian songs were written by the singers, their producers, or the numerous male artists who appear as guests. Melissa Yanos makes a good first impression on "Should've, Would've, Could've," a wistful vignette about missed chances that echoes Matt Young's local pop hits of the early 1990s. Her other songs include "Step On" (about female empowerment that would've been better without the Jawaiian-lite rapper) and "Not As Much As I Do," a mournful account of being in love with someone who's already taken. Tawney's "Don't Rush" is one of several songs with a similar synth-based sound. Another single-monikered singer, Chantelle, stands out on "Children's Cry," an earnest sociopolitical statement made notable by the Hawaiian language used on the song's intro and chorus. She also shows potential local appeal with "Lonely Nights," the plaintive ballad that closes the collection. Mandi Seekings and Tiana are the other "girls" who make their debut here. "Not As Much As I Do"
The influence of the Brothers Cazimero, Ho'okena and 'Ale'a is evident in the smooth harmonies and crisp arrangements, but with three distinct lead voices with falsetto capabilities as well, Holunape establishes itself on its own terms. They're traditionalists at heart, but they're not clones of older musicians. 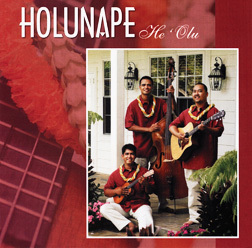 Holunape offers several instrumental variations of the basic Hawaiian trio, with Hopkins on ukulele and bass, Kaluhiwa bass and lead or rhythm guitar, and Nakamura on rhythm guitar. Guest Jeff Au Hoy sits in on occasion on steel guitar and piano. The use of tinny-sounding synth strings on the title song is their producers' only error. "Ia 'Oe Ke La E Alohi Nei"
"Ka Pua O Ku'u 'I'ini"
Female singer/songwriters have been baring their souls in pop music for years on end. Hawaii's own Preeta can be considered a world-class contender in this genre. The credits reveal that her record label is headquartered in Kilauea on the Big Island, her sound could be from anywhere. Her introspective originals are universal in style and subject matter. "Good Enough" stands out as an outsider's reaction to the corporate music industry. Preeta caps a series of witty observations by telling her struggling peers that they're good enough that there's no need to try be someone they're not. Elsewhere, she explores the vagaries of love from several perspectives, whether it's escaping a bad relationship, the joys of being in love, or the uncertainties that come with a directionless life. Preeta's beautifully crafted songs will reassure kindred souls that they're not alone.